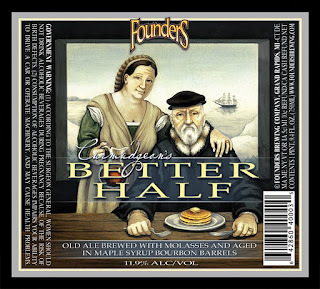 Founders Brewing Co.’s Co-Founder and Vice President of Marketing, Dave Engbers, announced today that Curmudgeon’s Better Half would be the next release in the brewery’s 750mL Backstage Series, with availability beginning on February 13, 2012, just in time for Valentine’s Day. There has been a great deal of anticipation and speculation on the upcoming Backstage release because of the success of the first two large bottle format releases: Blushing Monk and Canadian Breakfast Stout earlier in 2011. The purpose of the series is to bring some of Founders’ most sought after beers, which had previously been available primarily at the brewery taproom or at a few select events, to a much larger audience. 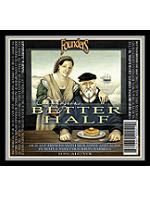 Curmudgeon’s Better Half is a re-branding of the beer formerly known as Kaiser’s Curmudgeon, which has only been served at Founders’ taproom and in extremely limited draft distribution. Curmudgeon is an old ale brewed with molasses and aged on oak; it becomes Better Half after aging—for 254 days—in bourbon barrels that have more recently been aging Michigan maple syrup. As a result, Curmudgeon’s Better Half is a bit sweeter than her miserly counterpart. Appropriately, the beer label depicts her holding a pitcher of syrup for the Curmudgeon’s breakfast, and is released at the perfect time of year for you to buy one for the Better Half in your life. The company is not revealing any additional releases in the series, but Engbers said it would consist of many of the “popular one-offs and possible big experiments” that have been offered in the taproom over the years and have become favorites among patrons and brewery staff. The company expects to release two additional products in the Backstage Series later in 2012.